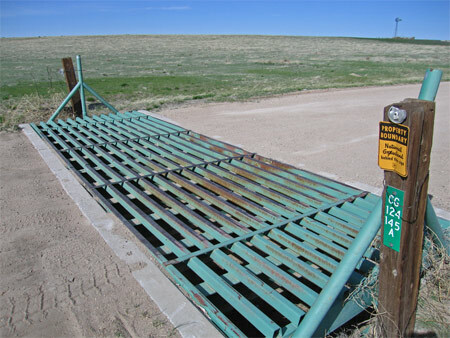 A few months ago, President Obama was reading a report that there were over 100,000 cattle guards in Colorado. The Colorado ranchers had protested his proposed changes in grazing policies, so he ordered the Secretary of the Interior to fire half of the cattle guards immediately! People without any knowledge of cattle or cattle guards, please click the Continue Reading button. Cattle will not step on them. A humor submission from Carol. Whoa ... More on Muammar. Maybe not so Daffy? This popped up on my screen about an hour ago. Maybe a bit more. This guy is either a loose cannon or ..... hmmmm. Maybe he could block the dreaded migration he speaks of. It can’t cost more then Europe pays now, surely. We live in interesting and frustrating and maddening times. Col Muammar Gaddafi has warned that Europe runs the risk of turning “black” unless the EU pays Libya at least €5 billion (£4.1 billion) a year to block the arrival of illegal immigrants from Africa. Speaking at a ceremony in Rome while standing next to Silvio Berlusconi, Italy’s prime minister, Col Gaddafi, 67, said that unless his request for money was met, Europe would otherwise become “another Africa” as a result of the “advance of millions of immigrants”. “Tomorrow Europe might no longer be European and even black as there are millions who want to come in,” he said. “We don’t know if Europe will remain an advanced and united continent or if it will be destroyed, as happened with the barbarian invasions”. Another opposition MP, Luigi de Magistris, accused the Libyan regime of keeping tens of thousands of African migrants in “concentration camps” in the desert. Yeah so? Where ya want em. Over here? Probably not true and merely the charge of a left wing opposition bed wetter. And if the charge is true, yawn. No question about it, the world’s a mad,mad place and white folks seem to be losin’ it. What is it with this? 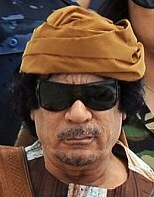 Gaddafi is such a disgusting looking character. If he weren’t a head of state he could easily pass for a homeless person living under a bridge in any country. But he has loads of ready cash and can hire his own audience. And the world MUST and DOES treat with the guy as if he’s just plain folks. Right. I know. It’s called diplomacy. I’m quite a bit short on that. Lucky I can spell the word without using spell check. Can you imagine any western head of state going to a muzzie country and simply suggesting to them that they may wanna try some other religion? Oh Boy. On Monday, the Libyan leader recruited the women through a modelling agency to join him and Mr Berlusconi, in viewing a photography exhibition at a Rome cultural institute which traced historical links between the two countries. Telling them that Islam was the “ultimate religion”, Gaddafi insisted that “if you want to believe in a single faith then it must be that of Mohammed,” according to one of the women who sat through the lecture. Afterwards the two leaders were due to attend a cavalry school to watch a display of riding involving 30 thoroughbred Berber horses imported specially from Libya, followed by a state dinner. On Sunday night, during an encounter with 500 young women hired by the same agency, Col Gaddafi handed out copies of the Koran and told them that Europe should convert to Islam. “If I went to Tripoli to demand that Libyans convert to Christianity, what are the odds that I would return in one piece?” said Rocco Buttiglione, the president of a centre-Right Catholic party, the UDC. Italy was becoming a “Disneyland”-style theme park for Gaddafi’s “senile vanities”, said Fare Futuro, a political foundation linked to Gianfranco Fini, a senior government power broker with whom Mr Berlusconi recently had a dramatic falling out. Rosy Bindi, an MP from the main opposition party, said that the spectacle of hundreds of Italian women being bussed in at Col Gaddafi’s whim was a “humiliating violation” of their dignity. They evaded the police AND the Navy? Somebody is not very serious about security here. It’s like I have long believed. These folks know what they can get away with. They know for certain that instead of bullets or mustard gas, the people they oppose will try and use words. They will not want to hurt anyone. I guess what bothers me so much about these people, is the idea that they have ALL the correct answers, and are willing to take on the job for all of us to be saved from the threats they see looming. Like, the sky falling. Of course, only homophobic fascists disagree with them and need to be silenced as only their opinion is allowed. These people are nothing but a seagoing mob. The only way to deal with a mob, is to exterminate it. Problem solved. Some folks may differ but that’s how I see it. Greenpeace claims its activists have shut down a ‘’dangerous’’ oil drilling operation by a British energy company in the Arctic. The environmental group said four expert climbers in inflatable speedboats had evaded the Danish navy to climb up the inside of the Cairn Energy oil rig off Greenland. The four campaigners are now hanging from the rig 15m above the icy Arctic ocean in tents suspended from ropes, halting its drilling operation, Greenpeace said. The campaigners, who are protesting against what they claim are the ‘’huge risks’’ energy companies are taking with the environment by drilling for oil in deep water, say they have enough supplies to occupy the tents for several days. They claim that if they halt drilling for a short time, Cairn will struggle to meet the deadline to complete exploration before the winter conditions set in, forcing the company to abandon the search for oil off Greenland until next year. Sim McKenna, from the US, who is one of the climbers, said: ‘’We’ve got to keep the energy companies out of the Arctic and kick our addiction to oil, that’s why we’re going to stop this rig from drilling for as long as we can. ‘’The BP Gulf oil disaster showed us it’s time to go beyond oil. And it’s this bit of quote that makes my point I believe. Last week the campaigners said they were confronted by a Danish warship sent to protect the drilling operation in the seas off Greenland. Greenpeace said it had been warned that the ship would be raided and the captain arrested if it breached a security zone set up in the area. So what did happen? Nothing except that the mob has occupied the rig. Which is exactly what they knew might would happen. He must have used the whole darn can, and in a small space. I didn’t know they still made aerosol canisters here that used the kind of stuff that could ignite. Reason I thought that is cos of all the planet saving things they do here banning this and that. For example, we can no longer find aerosol Pam spray. It’s in a pump type container here, while we were able to buy it back home recently in aerosol form. Whatever .... This is a heck of a way to keep the home fires burning. Better to keep light bulbs on hand in that loo from now on. Woo-hoo. Just had a thought. Creepy now in that room if they can’t find the damn spider. The 28 year-old suffered severe burns after attacking a spider with an aerosol can at his home. A spokesman for Essex Fire Service said: “It appears the wife had spotted the creepy crawly in the bathroom and asked her husband to capture it. The Environmental Protection Agency has denied a petition filed by environmental activists seeking to ban lead in ammunition, saying such regulation is beyond the agency’s authority. Tens of thousands of citizens wrote in and called. Good. Never let your eye off of government, and smack the snot out of them the instant they step out of line. Now write them again and tell them to mind their own damn business regarding fishing sinkers. Lead at the bottom of sea is about as safe as it’s ever going to be, and fish don’t eat sinkers. Duh. Stupid little totalitarian “centers”. Screw ‘em till they bleed. Great Minds Think A Light? While Peiper was starting his hoard of 75W incandescent bulbs, I was researching fluorescent upgrades. My state - yours too perhaps - has a rebate to businesses if they upgrade their old style tube lights to the newer high efficiency designs. You can look up New Jersey’s Smart Start program, and you’ll see that the state will pay $10 per fixture to retrofit the modern gear. Gee, $10. Wow. But if you run a business, and have 300 fixtures in your office, that starts to add up quickly. Especially when it only costs you $20 plus labor to do the retrofit, and the actual labor only takes 15 minutes. High tech bulbs extra of course. But make the changeover and you can save more than 40% on your lighting bill. And that really adds up. Most businesses, office and retail, have those 4 1 1/2” diameter 48” 40 watt bulb fluorescent fixtures in the dropped ceiling panels. Fluorescent lights run on high voltage, so they require a device called a ballast to raise the voltage. Ballasts last just about forever, and the bulbs are generally good for 5 years in theory. The old style ballasts are of the “magnetic” style which means they have lead heavy transformers inside. Used with the standard F40CW bulbs they throw that icky green, nearly seasick light in the 4100K color temperature range, with a terrible CRI (color rendering index) of 50-65. Which means everything looks awful under standard fluorescent light. Some years back the light bulb companies came out with 32 and 34 watt “energy saver” bulbs for these fixtures, which helped companies save some money. Maybe. It turns out that the magnetic ballasts tend to overdrive these bulbs, so their lifespan is shortened some. And almost nothing is more “generic” than a 48” T12 bulb, which means people buy them based on price, and ignore the color temperature, the lifespan, and even the output lumens of the bulbs. Which allows a lot of cheap, dim, short life bulbs to be sold for a “great price”; you can get them as cheap as $1, although a decent bulb will usually cost $2.50. These days ballasts are “electronic”. Instead of being the size and weight of a brick, today’s ballasts are thin and light. And today’s bulb is the slimmed down T8, which gives off just as much light as the old T12. But wait, there’s more! A modern electronic ballast only costs a couple dollars more than the old magnetic ones. And there are now very high efficiency T8 bulbs for sale that outlast the old F40CW by 2 to 1. And you can get them in a variety of color temperatures, right up to 5000K to 6500K, with CRIs of 80 to 90. That means the bulbs produce a very white light like daylight, and they don’t mess with colors much at all. Put together new ballasts and new bulbs in your old fixture, and you can save 30 - 45 percent on your office lighting bill. That adds up real fast. One of the nicer ballasts is the Sylvania Quicktronic QTP4X32T8/UNV ISN-SC. At $19.49 it’s an instant start model, with a reasonably high 0.88 ballast factor, <10% THD, Class A EMI, and Class A sound. This means that it doesn't make noise, it doesn't give off radio waves that mess with your computer or radio, and it doesn't muddy up the electricity. Name brand company, American made product. Used along with 4 of Sylvania's Octron ECOLOGIC 800 XP 32 Watt 5000K bulbs, just under $5 each, you will get a brighter, whiter light with great color rendition, and a bulb that lasts twice as long, and use 36% less electricity. Use their 28 watt Octron bulb and save 45% on your electric bill, get the same amount of light you were getting using those 34w energy saver bulbs, the same double length bulb life, though it doesn't render colors quite as well as the 32w bulb. Philips makes a similar bulb called the Alto II, that gives similar lumen, CRI, and energy saving performance, but doesn't last quite as long, for slightly less cost. Both bulbs are available in color temperatures from the warm incandescent yellow (3000K) to the bright white (5000K). I like the bright white. I have one of those OttLite reading lamps, and that's nearly where it runs at. b) the bulbs don't dim out over time. The old style F40 T12 bulbs would start out nice and bright, but dim down to 80% after just a couple weeks, then ride out their lives at about 60% light output, even though they were using just as much electricity as when new. These modern T8 bulbs maintain 95% of their light output from day 1 until they burn out. So you get a lot more light/time for your lightbulb dollar. c) they fit in the same sockets as your old T12 bulbs, but since the bulb is only 2/3 as thick, getting bulbs in and out is much easier. At a typical 4000 hour business year, with the lights turned on and off once a day, when electricity costs you 15¢ per kilowatt hour, retrofitting to the modern ballast and high tech bulb will save you about $40 per year in a standard 4 bulb fixture, which means the ROI on your parts cost is just about 1 year. Add in whatever rebate your state might be giving, subtract off the installation labor, and the ROI is about 2 years. That's not bad at all, because you've got another 8 years life left on those bulbs, and your people will be enjoying a nicer quality of light the whole time. Other companies like Advance and Keystone make similar ballasts at similar prices. To get the most light from your bulbs, look for ballast that have a ballast factor of .85 of better. Low factor ballasts with a .70 - .75 ballast factor will save you even more money, but at the expense of luminosity. Which means they run the bulbs softly, and they don't make as much light. The claim made by the masters in Brussels is that 30 tons of pollution will be avoided over the years. Yeah, right. Like I care anyway. In fact, I go outta my way to leave a large carbon footprint. What a joke. Ppl all over Europe are stockpiling as I did last year on 100watt bulbs. This time it’s 75 watt that will very soon be phased out by big brother across the channel. Just shows ya. Folks don’t want the new energy savers and don’t want to be forced to buy them. But that doesn’t matter. Oh well ... time to see if I can still get the 75s. Might get a case or two of 60s while I’m at it. Can never tell if those will come in handy altho I hardly ever had use for them. EU jerks say use of energy saver bulb will also save money over time in spite of the cost. Yeah well, the paltry sum they claim I’ll save is not worth the effort. £37 a year. Oh woo-freekin-hoo. I’m not impressed. Or swayed. Last year 100W incandescent light bulbs were outlawed, triggering the first wave of stockpiling by worried consumers who do not like the more expensive energy saving alternatives. Now it will be an offence to import or manufacture 75W bulbs, although shops can continue to sell the model until stocks run out. The European Lamp Companies Federation said shoppers around Europe are already snapping up the last remaining stocks, with a 35 per cent increase in sales across the EU. Demand is highest in Germany, Austria, Poland and central Europe. Although the powerful light is also popular in Britain as a reading lamp or for lighting portraits or chandeliers in historic homes. Airum, a Finnish producer of bulbs, has reported a doubling of demand for 75W bulbs in the country compared to what is normal for August. Veronique Skrotsky, a spokeswoman for General Electric Lighting’s French operations, said people do not like the energy saving alternatives. She said compact fluorescent lamps (CFLs), which use a fifth of the energy needed for a conventional bulb, give off a sickly light. “It’s clear that customers find the light they give off ugly, it’s really terrible,” she said. CFLs have even been blamed for giving people headaches and skin rashes. Bobby Damney, a spokesman for the Light Bulb Company, a major British wholesaler and retailer, said the company has seen a 10 per cent rise since June. He said consumers do not like the “horribly shaped” CFLs, which also take longer to turn on and can flicker. “It has been a chore for some customers trying to replace the bulbs,” he added. Supermarkets in the UK have already phased out 75W bulbs but independent retailers and wholesalers reported an increase in demand. Robert Parker, technical adviser to the Historic Houses Association, said people who live in older homes are stock piling old fashioned lamps. Even halogen lamps, which give off a warmer glow and come in traditional shapes, will not fit into all old fashioned fittings. The panic buying of light bulbs is expected to get worse when 60W bulbs are banned next year and all incandescent bulbs are phased out by 2012. Incandescent light bulbs are being phased out in order to meet the EU’s ambitious climate change targets to cut greenhouse gases by 20 per cent by 2020. It wasn’t a “jibe” and I sure didn’t read it that way. Jeesh. Talk about much ado. Guy writes something in a book and the folks who wait like a spider in a web just looking for insults, pounce. I had always thought (wrongly?) that groups did share genes. Maybe these days not all groups always share the same genes due to cross marriages etc. But I fail to see the insult. And he was pretty well correct where muzzies are concerned. He doesn’t want to see his country become something else other then German. Who can blame him? The English already refer (with no love) to London as Londonistan. Or something close to that. Shows ya how ppl feel. They can’t all be racist surely. And come to think of it, that word has been overcooked and badly used. Take a look. See the link. What was so bad about what he wrote in a book? Don’t like or agree with his views? Don’t buy the book. A senior German central bank official has suffered fierce criticism after the release of an extract from his book in which he said Jews all have the same genes and Muslim immigrants cannot integrate. Thilo Sarrazin, a member of the six-man board at the influential Bundesbank, has been condemned by German government officials and immigrant leaders after excerpts from his new book, Germany Does Away With Itself said “all Jews share the same gene”. Regarding Muslim immigrants, he continues: “I don’t want the country of my grandchildren and forefathers to be in broad swathes Muslim, where Turkish and Arabic is widely spoken, where women wear headscarves and where the daily rhythm of life is set by the call of the muezzins. He theorises that if the fertility rate of German “autochthons” remains at the same level it has been for the past 40 years, then population will drop to 20?million, while the Muslim population “could grow to 35 million by 2100”. Mr Sarrazin, 65, who says his comments are not racist, argues that immigrants from countries such as Turkey depend on the state and bring down the country’s level of education. Senior German politicians have demanded that Mr Sarrazin step down from his Bundesbank post and resign his party membership of the left-leaning Social Democrats. Stephan Kramer, of the Central Council of Jews in Germany, said: “Whoever tries to identify Jews by their genetic make-up succumbs to racism.” Kenan Kolat, a leading member of Germany’s Turkish community, called on Angela Merkel, the German Chancellor, to expel Mr Sarrazin from his Bundesbank post. ok so … a couple of scum break into house, man in house opens fire , so he’s a racist. WTF??? Frenchman in the news. I guess the folks over there can have guns. Now we’ll see if they’re allowed to defend themselves. After all, it isn’t at all as though he shot anything valuable. Like a real person. Just a couple of itinerant would be thieving traveling burglars. WHEN Rene Galinier pulled the trigger on his old hunting rifle, he said he was acting to defend his home. Two young eastern European women had broken into his house while he was taking a siesta, and when the startled 73-year-old woke up, he shot and wounded them both. Since Mr Galinier fired at the intruders, reverberations have been felt far beyond the four walls of his modest bungalow in a village in south-west France. The case of “Papy” Galinier has become a cause celebre thanks to the bitter debate caused by President Nicolas Sarkozy’s recent crackdown on the Roma community in France, which has seen itinerant camps demolished and hundreds of Roma returned to eastern Europe. On one side stand those who have condemned the expulsions as redolent of Nazi Germany - on the other are those who say Mr Sarkozy has not gone far enough. In the middle of the political maelstrom sits Mr Galinier who is in a local prison cell, charged with attempted manslaughter and denied bail pending trial. Mr Sarkozy started to shut hundreds of illegal Roma camps in response to clashes between police and traveller communities last month. With more expulsions planned, and criticism mounting at home and abroad, he hopes to bolster support for his stance next week by convening a summit of interior ministers from countries facing similar immigration debates. Western European governments are split on the matter. While Italy is considering similar action, Britain will be sending a senior official to the meeting rather than the Home Secretary, Theresa May, for fear of being seen to endorse Mr Sarkozy’s policies. Nissan-lez-Enserunes, where four generations of the Galinier family live, provides a vivid snapshot of why it has become such a charged issue in France. Not far from Montpellier, it is a picture- postcard image of southern French living, with elegant stone houses set among narrow winding streets filled with flowers. Mr Galinier has lived in the area all his life, raising two children, working for the council, then retiring to spend time with his wife and grandchildren and tend his garden. He had been targeted by criminals twice before. In 2002, thieves attempted to break in and in February this year goldfish were stolen from his garden pond. Among villagers, the finger of blame for local petty crime often points - rightly or wrongly - to a patch of wasteland several miles outside the village where a group of Roma recently made camp next to a motorway. The families and their wild-haired children live in ramshackle caravans among piles of rubbish. On the afternoon of August 5, two women in their early 20s broke into Mr Galinier’s home. The unarmed pair, who speak no French and have not given police their names, were both shot at from just a few yards away. One was hit in the groin, the other in the chest. Both are in hospital awaiting identification and questioning. Damn! No kill shot though. Oh well, we take what we can, when we can. Good for Mr. Galinier. Makes a change. btw … no link found so I copied from the paper. I always thought even the same brand of beer could taste differently at various times in the year. Or was that just an old ex-smokers experience? Anyone else notice that? The wet weather may have frustrated holidaymakers, but brewers say that the summer showers will help improve the taste of beer. That’s due to the rain producing a better quality of hop cones, which add flavour to beer. I didn’t know that, and this summer has been a wet one. Especially August in my part of the country. Either always chilly and misty or just plain rain. So far this week we’ve had two days of sun. I’m not a connoisseur on drinks but, there is a difference between ale and beer. Right? I don’t think there are any hop crops in this general area which does have farm land. Of course, I wouldn’t know a hop crop from a wheat crop. Britain’s oldest brewers say the wettest July on record and the drizzly August has helped produce a better quality of hops. The company produces 203,000 barrels of ale a year and owns nearly 400 pubs. Better beer this year? I’ll drink to that. RAY STEVENS ON IMMIGRATION …. OCM gave us the link and this is well worth posting here. Always liked Ray Stevens .... The music alone takes me back to my Nashville years. Miss that but not the climate. France continues deportation of illegals while pinko handwringer traitors cry foul .. Vive Sarkozy! Some idiot is comparing this to the Nazi and Vichy treatment of Jews. Yeah right. Like the Nazis PAID their victims to leave. Uh huh. What’s so interesting as well are the images captured of all the wee babes crying. Sure, the kids are innocent. But the problem wouldn’t be here if the parents hadn’t settled illegally to begin with. But the shutter bugs of the press continue taking kiddie shots and the weepy, bleeding heart (falsely) libtard left will continue to condemn Sarkozy and use the ‘R’ word in relation to this cancer in France and throughout Europe. The photos they don’t bother taking are the ones showing ruined property and garbage and mess made by these ppl. A French spokesman last night said that while all people have a right to travel freely, they must not confuse that with a right to settle illegally in France and become a state burden. You will not hear that from any Brit politician. I heard that on a radio report last night but did not see the quote in any of the three papers we have read today on the subject. SARKOZY FLASHES RACE CARD IN CRACKDOWN ON CRIME. Meanwhile, there’s to be a meeting of various officials from different European states on the subject of immigration and the problem in France specifically. Typically, England is NOT sending their top foreign policy official as they do not want to be seen as “approving of the measures taken by President Sarkozy.” So they’re sending a lower ranking official. is beyond me. Only a total idiot would buy the suggestion they are the same. btw ... This headline is misleading since it’s doubtful France is expelling ALL Gypsies. Also, what’s with the term used here, “it’s gipsies?” The word “it’s” implies that these folks belong to France. THEY DO NOT! France expels its gipsies, is this a chilling echo of the Nazis… or just a desperate attempt to tackle crime? Dawn breaks over the outskirts of Paris, its arrival marked by the banging of fists on the locked door of a caravan. riot police, batons in hand. ‘Get up,’ one yells at her. He has pledged to destroy 300 gipsy camps nationwide by the end of the year, deporting thousands. Sarkozy makes no bones about this no-nonsense approach. He claims that the Roma, many of whom arrived in France after Romania and Bulgaria joined the EU in 2007, are responsible for an outbreak of crime. His solution? Raze their camps, round up their inhabitants and then stick them on a plane home. As a sweetener, there’s a payment of £245 per adult and £80 per child. And as it is revealed that immigration swelled the UK population by 196,000 during Labour’s last year in power, it is a problem we, too, may one day face. “May someday face? How about right now? Recently, as in this past week, a traveller family won a court stay on their eviction from a site they don’t own anyway, when they applied for an injunction claiming that the town council had a DUTY to find them an alternative site due to their, CULTURAL ROOTS. It’s now expected other travellers facing similar evictions could use the same delaying tactics. Images of Roma families being bused to airports have provoked condemnation not just in France but across Europe. Sarkozy has been accused of ethnic cleansing and of fanning racism. Indeed, Jean-Pierre Grand, a deputy in Sarkozy’s Union for a Popular Movement (UMP), compared the President’s policy to Vichy France’s round-up of Jews during World War II. Collaborating with the Nazis during the occupation, the French authorities deported 76,000 Jews — and thousands of gipsies. Many were killed in Nazi concentration camps. Even the Pope has added his voice to the chorus of criticism — pointedly telling French pilgrims to accept ‘legitimate human diversity’ and asking parents to ‘educate your children about universal brotherhood’. Maybe the pope ought to invite them all to come live with him in the Vatican. Need to hide his gold and silver plated everything though. Others point out the futility of what Sarkozy is doing. Because those deported are EU citizens, they have a right to return to France should they choose. The immigrants he is sending home live in squalor and cannot support themselves. Forget the legal niceties and liberal sensitivities, that is the reality on the ground. As quickly as the Roma are sent back, they will return. It is a point emphasised by the experience of the Cojocaru family. They were kicked out of France last week. Yesterday, the Mail tracked them down. They revealed that despite being handed a total of £740 by the French government in exchange for leaving, they intend to return at the first possible opportunity. Mother- of - three Argent ina Cojocaru, 35, explained: ‘We left Romania a year ago for a better life. We could not afford to live here. It is so poor. We could not survive. ‘Even though we had no jobs in France, we were in a better situation than others back in Romania,’ said husband Valentin, 40. Well then, perhaps with luck when they return some stout hearted patriotic Frenchman will see to matters as in, see that they don’t return yet again. Maybe something a bit more permanent then a cash bribe.